Think you know your North Korea? Here’s our alphabet run-through. 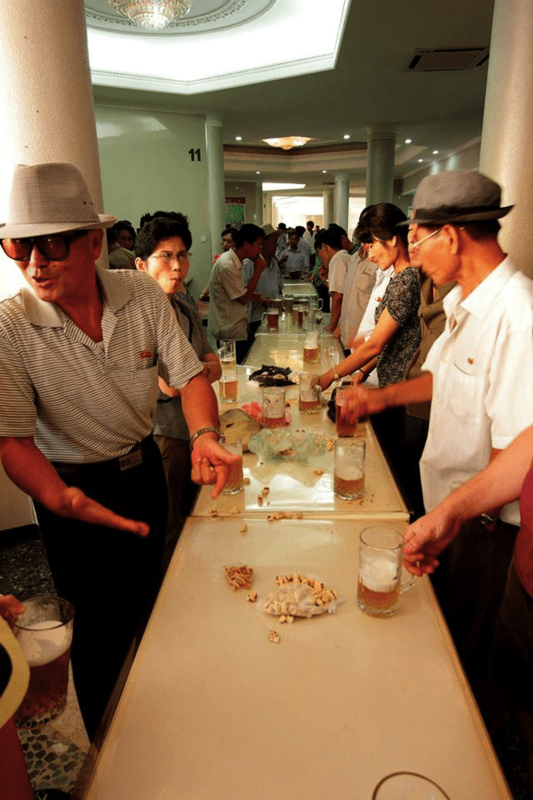 A common misconception about the DPRK is that as the DPRK is a very strict society alcohol is not readily consumed. This couldn’t be further from the truth. A common response from our customers following a trip to the DPRK is, “I expected it to be interesting, but I didn’t expect it to be so much fun.” North Koreans, like their southern counterparts, love to drink soju and beer (sometimes even mixing it to create so-maek) and at 1 USD for a large bottle of beer and the same for a bottle of soju, it is very affordable for tourists to drink along with them. Alcohol plays a very important role in social gatherings and whilst walking through Pyongyang’s Moran Hill, our customers often join local people who are sharing bottles of soju and dancing to traditional Korean music. It is impossible to get a complete picture of the DPRK without talking about those Korean-influenced Chinese towns and cities that sit along the Tumen and Yalu Rivers. From the 1940’s to the 1960’s, the border between the DPRK and China, although clearly marked, was not regulated to the extent that it would later be. This means that people travelled freely between the two countries and one person from near Tumen remarked that he remembers his mother needing ingredients for dinner and simply popping over to her relatives across the border to pick some up and then return to the family house in China. In addition, many of the Chinese soldiers sent to the DPRK during the Korean War hailed from the borderlands areas of China and this also helped to strengthen ties between those towns and cities either side of the dividing rivers. Up until a few decades ago, the Korean-Chinese, both emotionally and socially, had much more in common with the Koreans than they did with the Chinese. Over time, however, this has changed dramatically and although many of the shops and towns along the border still display everything in Korean, the emotional connection to North Korea is being eradicated. Although the causes of the 1994-1998 DPRK famine are disputed, the fact that a famine occurred, is not. It is impossible to get an exact figure on the number of deaths that resulted from this but the most realistic estimates seem to be around 600,000. Since this, a number of reforms have been put in place including the promotion of potato as a primary crop. As a result of reforms over the years, crop yields have risen to their highest levels in decades which has in turn, reduced the country’s dependence on cereal imports (700,000 tons in 2011 to 300,000 tons in 2014). In addition, farmers, who previously had to give the vast majority of their crop output to the government are now, under Kim Jong Un’s May 30th policies, ostensibly allowed to keep 60% of their crop output. They can then use this excess product for their own families, to sell at markets, or to trade for other goods and services. D is for Diplomatic Relations. In addition to a number of embassies across Asia, Africa, and South America, the DPRK also has an impressive number of embassies in Europe (twelve). With regards to those countries that hold diplomatic missions in Pyongyang, there are twenty-four. Many are surprised to find that the UK fits into both of the above categories and for a very interesting account of what it’s like to work at the British Embassy in Pyongyang, take a look at Only Beautiful, Please by John Everard. One country that formerly owned an embassy in Pyongyang was the Central African Empire. This is a country that existed for about three years until Bokassa was overthrown in 1979 and the country became the Central African Republic. Unfortunately for the embassy workers, they were left in limbo in Pyongyang without pay and on the whole, forgotten about. Eventually they took to stealing from local shops in Pyongyang and even commandeered the pool room at one of the international buildings, demanding that other foreign workers pay to play at the pool tables. One night a fight broke out and the local police got involved. Following this and other alleged scuffles, the DPRK government paid for the entire mission’s flights home to what was at this stage, a different country from the one they had left. Following a rocky start with mobile phones (they were banned in May 2004), a love affair with them has blossomed since their re-introduction in 2008. With around 2 – 3 million people now owning a handset, the variety has increased from a basic model to advanced smart phones. In scenes reminiscent of a Beijing, Seoul, or Tokyo department store, it is now not unusual to see young women in Pyongyang’s more trendy places glued to their smart phones. In addition to the advancement of mobile phones, the DPRK has also unveiled its answer to the iPad – its Samjiyon tablet. The affordability of this however is still very much out of the reach of even those in the mid to upper wage brackets and as such, is quite rare to see in Pyongyang. Regarding tourists, mobile phones were previously banned from being used within the country but this policy was discontinued in 2013 and our customers are now pleasantly surprised that they can now carry with them their phones, laptops, iPads, ebooks, and many other types of electronic equipment. F is for Film Production. Movies served as one of the primary passions for late DPRK leader General Kim Jong Il, and as such, he was instrumental in developing North Korea’s movie industry. Many of the films were made at the Pyongyang Film Studio, just outside the capital. The studios, which are a feature on many of our tours, consists of backlots that replicate old Chinese, Korean, Japanese, and European towns. An interesting point to note about north Korean films is that a few of the US Army defectors who left their posts in the South to cross the DMZ, actually played the baddies in these movies. For more information on this, it is worth taking a look at the excellent Crossing the Line documentary which was co-produced by Nick Bonner of Koryo Tours. Going to the cinema and watching movies at home are two of the favorite past-times of those in North Korea and although not many foreign films are released in the DPRK, Bend it Like Beckham was said to have been very well received when it was shown on DPRK state television in 2010. G is for Gender issues. H is for Hermit Kingdom? Rarely does one come across an article on the DPRK without finding at least one reference to its status as a hermit kingdom. Such a title infers complete seclusion from, and ignorance towards, the outside world. Anyone who has traveled to the country will know that this is not true and the Koreans, fully aware of what the world’s perception of them is, love to surprise travelers with their impressive knowledge of political and cultural affairs. Whether it is by stating that their favorite band is One Direction, or by being able to list the starting XI of the Manchester United soccer team, the look on a tourist’s face is often bemusement. We have been taught to believe that the Korean people have absolutely no access to information outside their own country but anyone who has traveled there and has talked with locals, will know that this is not entirely true. Notwithstanding some foreigners and a small number of high level government officials, internet is not available in the DPRK. Instead they use their own intranet system (kwangmyong) which is free to use. The intranet, despite not allowing the user to access the world wide web, provides a key function in north Korean society. Containing a domestic news service, a social network function (not quite Facebook), academic journals, and around 5,000 websites, the service is used by many people every day and according to AP’s DPRK Bureau Chief, is a source of pride within the country. As a result of Japan’s annexation of, and brutality shown to, the Korean peninsula between 1908 and 1945, Korea holds less-than-favorable opinions of its next-door neighbors. In addition to this, the unwillingness of Japan to make an apology (and stick with it) for its actions during the annexation has resulted in a political stalemate between the two countries. Through such events the pro wrestling bash in Pyongyang in 2014, attempts have been made to somewhat normalize relations but there is still a long way to go to achieving this (as is evidenced by the crowd’s reaction to the Japanese national anthem when the DPRK took on Japan in a World Cup qualifying game at Kim Il Sung Stadium). There is however a very intriguing group within Japan that does have good relations with the DPRK. Chongryon is an organization of ethnic Koreans living in Japan who sided with the DPRK following the division of the peninsula. The organization acts as something of a North Korean embassy in Japan and many of the members left Japan to settle in the DPRK around the 1960’s and 70’s (see Kang Chol Hwan’s book Aquariums of Pyongyang for further reading on this remarkable migration). A passenger ship, the Mangyongbong-92, used to sail from Niigata, Japan, to the eastern DPRK port of Wonsan but the service was discontinued by the Japanese government in 2003. K is for Kim Il Sung. Kim Il Sung was born just outside Pyongyang in Mangyongdae on April 15th 1912 (the same day as the sinking of the Titanic). He came from a religious background with his grandfather reported to have been a protestant minister, and his father an elder in the church. Japan, which annexed Korea in 1910, was hated by many Korean families and the Kim family was no exception. The family relocated to Manchuria in China and from there the young Kim rose through the ranks of the army, becoming renowned as an anti-Japanese guerrilla leader. Upon his return to Korea in 1946, he was installed by the Soviet protectors as Chairman of the Korean Communist Party. From this, he created the Korean People’s Army (KPA) and, with the help of Soviet advisors and equipment, Kim Il Sung constructed a large army skilled in infiltration tactics and guerrilla warfare. Following the Korean War in which the US and South Korea failed to beat the KPA, Kim Il Sung cemented his place as the leader of his country and would rule the DPRK until his death in 1994. Following his death, he was named Eternal President and to this day, visitors on almost all YPT tours can visit the Kumsusan Palace of the Sun to view his body lying in state. Owing to the huge importance that the government puts on education, the current literacy rate in the DPRK is 100%. According to the CIA Fact Book it is one of only eight countries to have achieved this. School is compulsory for children and up until recently, consisted of one year of kindergarten, four years of primary schooling, and finally six years of secondary education. Following a reform suggested by Kim Jong Un in 2012, the system has now changed to a twelve year one with the students now attending six years of primary school, three years of middle school, and three years of high school. This has put it more in line with the education system of other Asian countries. Following graduation from high school, the student may apply for university which is offered free of charge but if the student fails to obtain a place, he or she will enter the workforce. Those children who excel at a particular art such as music, language, or sports, may be offered a place at one of the schoolchildren’s palaces dotted around Pyongyang and other cities. Education is promoted not only among the younger populace but also the older generation and adults can often be seen furthering their knowledge of languages, history, politics and other subjects at the Grand People’s Study House. Mountains play an integral role in Korean culture and none as much as Mount Paektu. Koreans believe that Mount Paektu is the site of their ancestral origin and as such, have flocked to to the sacred site for centuries to pay homage. With the formation of the DPRK however, the site has taken on much more recent significance not least because of its association with the birth of Kim Jong Il. In addition, due to the dense forestry around the mountain, it was used by Korean guerrillas for launching attacks against the Japanese forces and it is said that Kim Il Sung organized his resistance at camps around the mountain. In addition to Mount Paektu, Mount Kumgang also plays an extremely important role in Korean culture, both north and south of the border. Although inside DPRK territory, the mountain became accessible to south Korean tourists from 1998 and numbers reached their peak in 2000 when 213,000 south Koreans visited the tourist zone. Interest, however, began to fall due to disagreements between the two countries and visits from the south stopped altogether in 2005 after South Korean national Pak Wan Ja was shot and killed after entering a military area. Mount Myohyang, situated about three hours drive from Pyongyang, is important due to Korean legend that names it as the birthplace of King Tangun, father of the Korean people. Today, however, it is known as the place that holds all gifts given by the international community to Kim Il Sung and Kim Jong Il. The International Friendship Exhibition consists of two cavernous buildings contained within the mountain and holds around 150,000 gifts. Some of the more notable gifts hail from former leaders of ex-communist states including Ceausescu’s bear head, Castro’s crocodile skin suitcase, and Stalin’s bullet proof limousine. N is for New York Philharmonic Orchestra. The New York Philharmonic Orchestra, on February 26th 2008, performed a show at the East Pyongyang Grand Theatre under the conductorship of Lorin Maazel. The orchestra began by playing the national anthems of both the United States and the DPRK, both of which were very well received by the north Korean and American attendees. The show finished with a rendition of Arirang, the famous Korean folk song and the official name given to the Mass Games. Aside from the performance itself, which was up to the usual standard of the NY Philharmonic Orchestra, the most incredible thing about the show was that it was shown live on state television within the DPRK, the first and only time this has happened with a televised event. O is for On Guard. The armed forces of North Korea were, in their present forms, established on February 8 1948. The Ground Forces, the Navy, and the Air Force, although separate, are all part of the Korean People’s Army (KPA). The reason that Military Foundation Day occurs on April 25 and not February 8 is because the former is the date in 1932 of the establishment of Kim Il Sung’s anti Japanese guerrilla Army. It is said that there are around two million active and reserve military personnel which means that 79.5 out of every 1000 people are militarily trained. By contrast, in the US, just 7.3 out of every 1000 are militarily trained. The military has always played an important role in north Korean society and not just in war situations as it is often those in uniform that can be seen repairing roads, fixing stadiums and, more recently, building airports. The money being spent on, and importance being given to, the military has risen since the collapse of the Soviet Union in 1989 as the DPRK found itself increasingly isolated and saw a strong military as the key to defending the country against foreign attack. The term Songun (military first) was coined by Kim Jong Il in the 1990’s and encapsulated a policy that would prioritize the KPA both with regards to the affairs of the state and with the allocation of resources. Recently, however, the term Byungjin has become more prevalent. It encapsulates the government’s belief in the importance of not just concentrating on the military and the advancement of nuclear weapons, but also, significantly, the development of the economy. The main newspaper, Rodong Sinmun (Worker’s Newspaper), is published daily, and locals can often be seen crowding around the latest edition at each of the metro stops in Pyongyang. The vast majority of news from within the DPRK that is published in the outside world comes from the news source Korean Central News Agency (KCNA). It has press exchanges with around 46 foreign news agencies including China’s Xinhua and South Korea’s Yonhap and has correspondents and bureaux in six countries. The South Korean government, which punishes pro-DPRK attitudes through its National Security Law, continues to block access to the KCNA website. One of the most interesting recent developments with regards the media and the DPRK was the opening of the Pyongyang Bureau of the Associated Press (AP). With this opening came the first western news organization to open a full bureau in the DPRK and it was hailed as a significant step forward in terms of media liberalization. AP has recently however had to refute claims that it has been discarding its normal journalistic standards and protocol in favor of maintaining good relations with the DPRK government and KCNA. In March 2015, the Guardian newspaper reported that the BBC is attempting to to expand its world service to include the DPRK. The BBC was reticent to explain how this would be possible but it is significant because unlike KBS and Voice of America which are funded by South Korea and the Unites States respectively, the UK is seen in the DPRK as being relatively impartial. In March 2014, the World Health Organization made Ebola an international public health emergency. Due to the growing concerns regarding the spread of Ebola to places outside west Africa, the DPRK government decided to close the borders to tourists and traders in October of the same year. Measures were introduced that caused all foreigners, regardless of country or region of origin, to be quarantined for 21 days upon arrival so that they could be observed by medical staff. Following a relative containment of the disease, the government, on March 3rd 2015, decided to reopen its borders to tourists and end all quarantine measures. In addition, the Pyongyang Marathon, which was initially closed to foreigners due to risks of the spreading of the disease, was later reopened to amateur runners. The 2014 Ebola outbreak was not the first time that the country has closed its borders to tourism due to an international public health problem – in 2003, it shut its borders for a few months due to the SARS outbreak. Although the constitution of the DPRK allows for freedom of religion, there are very few practicing Christians, Buddhists or other followers of faiths. Just as someone from Latin America might employ the teachings of the Catholic Church in their daily lives, the people of the DPRK use the principals of Jucheism to guide them. Christianity in North Korea is officially represented by the Korean Christian Federation and the city of Pyongyang is home to three protestant churches, a Russian Orthodox temple, and the Catholic Changchung Cathedral. 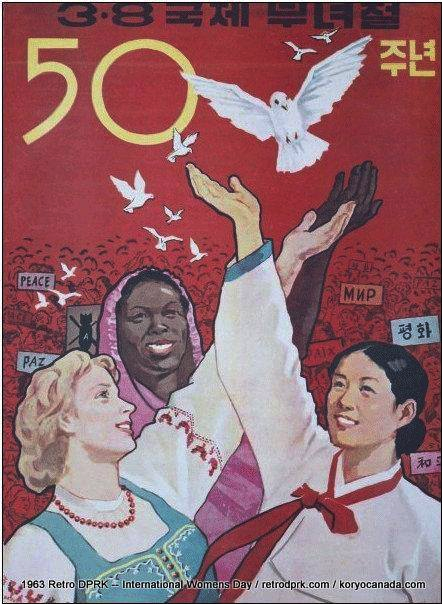 In 1988, the DPRK held the International Seminar of Christians of the North and South for the Peace and Reunification of Korea and invited papal representatives to to the opening of the Changchung Cathedral in Pyongyang. That same year they also sent two North Korean novice priests to study in Rome. At a National Council of Churches meeting in Washington DC in 1989, a North Korean pastor told the attendance of a substantial Protestant and Catholic contingent in the DPRK who attend home churches and more recently, in the 2000’s, famous evangelical preachers Billy Graham and Franklin Graham visited the DPRK. The importance of sport for many countries cannot be overstated. During the good times, it has the ability to lift a nation’s spirits and at the bad times, can unite the country in despair. The DPRK is no different. In a trend opposite to many western countries, schools in North Korea have consistently added more and more opportunities for children to play sport. This not only allows for a younger generation that is fit and healthy but also instills in them a competitive spirit which is increasingly absent from many school-aged children in the UK and US where less and less importance is being placed on physical education. Although there are many sports from which North Koreans can choose, the most popular are football, ping pong, taekwondo, volleyball, and weightlifting. Driving around Pyongyang, it is easy to see workers playing volleyball on their lunch breaks or days off and there are often tournaments where offices compete against each other or apartment blocks face off. Likewise, ping pong is a sport that is commonly played on lunch breaks, whilst weightlifting is a lot more specialized but is mainly responsible for the haul of medals the DPRK invariably wins at international sporting tournaments. Without a doubt, however, football is the sport that captures the attention of almost every person in North Korea and it is played widely throughout the country. Many visitors are shocked to find that Koreans know such players as Rooney, Messi and Ronaldo but with premier league matches being among the most watched programs on state TV, it should really come as no surprise. If through nothing else, the importance of sports in the international arena, can be summed up by the fact that many of the top sports men and women are given the keys to some of the finest apartments in Pyongyang. Just ask Om Yong Chol, the North Korean weightlifter who, at the 2014 Asian Games, was able to lift three times his bodyweight and secure a gold medal for his country. Those wanting to travel to the DPRK cannot travel to the country independently, they must book through an agency which has a working relationship with one of the tourism bureaus in the DPRK. The largest of these bureaus is the Korean International Travel Company (KITC) which is responsible for the vast majority of the tourists who travel to North Korea. Within KITC there are English, Chinese, Japanese, Russian, Spanish, Italian, German, and French speaking guides, two of whom will accompany each group throughout their time in the DPRK. Contrary to popular belief, almost every province in North Korea is open for tourists to travel to but many of those who go will only visit the country once and, understandably, want to see the main sites around Pyongyang and Kaeson (the DMZ). In the last few years, more and more places within the DPRK are opening for tourism and in 2012, Troy Collings, DPRK Managing Director of Young Pioneer Tours, was the first westerner to cross the Tumen border into the DPRK. This then paved the way for future tours which even include the opportunity to stay with a local North Korean family in North Hamgyong. The government, under Kim Jong Un, is beginning to see the benefits of tourism and the building of Masik Ski Resort, new hotels, and even a new airport (due to open in summer 2015) provides evidence of this. As prices has become more affordable and restrictions on US passport holders have faded, tourism to the DPRK is becoming more and more popular. That being said however, with only around 10,000 tourists visiting each year (compared with the 10.1 million visiting its neighbors to the south), it is still a destination very much off the beaten track. In just one of many quotations that sum up the quality of reporting into DPRK related i ssues, the Washington Post’s Max Fischer stated that with regard to North Korea, “almost any story is treated as broadly credible, no matter how outlandish or thinly sourced.” The reporting of uncorroborated information as fact, is pervasive throughout not just the typical tabloids but also the more reputable newspapers and news stations including the Guardian and the BBC. Instances of careless and lackluster reporting have been as numerous as they have been absurd with the most famous instances including, the execution of Hyon Song-wol for the production of pornographic movies, the bombing of solitary figure Kim Chol for “drinking and carousing” after the death of Kim Jong Il, the execution of Jang Song Thaek by being fed to dogs, Kim Jong Il obtaining 5 hole-in-ones at his first golfing attempt, and that all male students must have the same haircut as Kim Jong Un. In the event stories are found to have no factual substance, the mass media very rarely print corrections which means the casual DPRK observer has no option but to continue believing the sensationalism. DPRK analyst Andrei Lankov explained the reasoning behind this by opining that newspapers rarely retract stories on North Korea as they are scared to be seen to be in any way pro DPRK. This fear of being seen as supporting the North Korean government would also explain why the media rarely runs with reports which demonstrate, for example, a growth in the economy, or a a reduction in the sizes of reform-through-labor camps. The Vice documentary crew have entered North Korea on a number of occasions and, quite often, it has been their pieces on the DPRK that have served as many people’s first glimpse of the country. Although it is difficult for journalists to get into the country, the Vice crew, notwithstanding their less than flattering portrayal of the country, have been granted access on a number of occasions. The most recent documentary followed the escapades of Dennis Rodman as he embarked on his “basketball diplomacy” mission in the DPRK. Although Rodman was publicly shamed in the United States for his blossoming relationship with Kim Jong Un and subsequently distanced himself from the leader of the DPRK, such instances of grassroots internationalization are a necessity if the world does in fact want North Korea to start engaging more with other countries. As Michael Kirby noted in his ‘Conclusions and Recommendations’ of the UN Human Rights report into the DPRK, such a scenario may only be realized “through more people to people contacts in areas including science, sports, good governance, and economic development, to provide the citizens of the DPRK with the opportunity to exchange information and be exposed to experiences outside their country.” This is exactly what Dennis Rodman was actively achieving through ‘basketball diplomacy’ but was ultimately vilified for his efforts. W is for World Cup. The World Cup is an event anticipated in the DPRK with the same enthusiasm as any other football loving nation but of course, this anticipation is all the more visible if their country has qualified for the tournament. Most recently, this happened in 2010 when DPR Korea managed to qualify for the South Africa tournament by finishing above Iran in the Asia qualifying stages. Being drawn in the same group as Brazil, Portugal and the Ivory Coast, did not do the 105th ranked team in the world any favors and as expected, they did not progress to the knockout stages of the world cup. Nevertheless, the fans in the DPRK are only too aware of the achievement of simply qualifying for the World Cup and as such, the players, upon their return, were treated as heroes (and not sent to coal mines as had been reported). Rewind forty-four years to the 1966 World Cup in England a much different story unfolded. Taking place only thirteen years after the end of the Korean War, the DPRK was a country of which people knew very little. Nothing at all was expected of them but they sent the English fans wild when they beat Italy 1-0 in order to advance to the quarter-finals of the tournament. Once in the quarter-finals, they had to play Portugal and again had the world scratching their heads as they went 3-0 up by half time. The joy, however, was short lived as the Portuguese scored five goals in the second half to win 5-3. As with the 2010 World Cup, the players were reported to have been punished for their failure to beat Portugal but as with the case forty-four years later, these allegations were shown to be unfounded. Middlesborough, which hosted all of DPR Korea’s home games, still have close ties with North Korea and in 2010, the Middlesborough Ladies team became the first British team to travel to the country to take part in a football match. Roughly 25% of people employed in the DPRK work within the agriculture industry. This is compared with just 6% in South Korea. The reason for this is because North Korea relies more heavily on man power that their more industrialized neighbors in the south. Due to a poor transport network within North Korea, even those farms that have tractors and other gas powered machinery are often unable to use them as they cannot acquire the petrol or diesel needed to make them run. For this reason, oxen are used to great effect and their importance cannot be overestimated. Strong, reliable, and hardworking, state media often praises the animals as the reason the farming community has begun to exceed output expectations. In addition, oxen played a vital role in transportation throughout the Korean War and this romantic viewpoint combined with the practical nature of the animal mentioned above, serves as the reason why it is a political crime to kill one. Y is for Young Pioneers. With presents rarely given, and big celebrations rarely held, birthdays in the DPRK are not celebrated in the same way that they are in western cultures,. The main birthdays in the DPRK are, in keeping with Korean custom, the first, tenth, and sixtieth with everything in between lacking much in the way of special occasions. Perhaps it is for this reason then, that often the thing an adult in the DPRK remembers most about his or her childhood is the day they became a Young Pioneer. A child becomes a Young Pioneer between the ages of nine to eleven and is presented with the red scarf and Young Pioneer button at a ceremony at school with the family in attendance. Often the ceremonies take place on a national holiday and after the ceremony the child and his or her family will go to a park for a picnic where the family may present the Young Pioneer with gift wrapped presents. The mission of the Young Pioneers is to prepare children mentally, morally, and physically to socialist builders of the Juche idea and one cannot be admitted until his or her teacher believes they are ready for the challenge. Although the standards are not set too high and everybody is expected to join by the time they reach eleven, some may be accepted earlier which is seen as a great source of pride for the Young Pioneer and his or her family. During the time of the Eastern Bloc, there were around thirty countries that belonged to the Young Pioneer movement. Adults in the DPRK reflect warmly on this period as they would entertain children coming from all over eastern Europe whilst they themselves got to experience other countries. Z is for Special Economic Zone. A Special Economic Zone (SEZ) is an area within a country that does not conform to the same economic rules and regulations of the rest of the country. The purpose of these areas (of which China had many before it opened up fully) is to allow investment to flow into the country without risking any large scale political or social instability. The four SEZ’s currently operating within the DPRK are located at Rason, Mount Kumgang, Hwanggumpyong and Whihwa Islands, and Kaeson. Buoyed by the success of the zones, Kim Jong Un, in his June 28 New Economic Management Measures announced the proposal for a further thirteen Provincial Level Special Economic Zones and then in July 2014, the Presidium of the Supreme People’s Assembly announced yet more that were earmarked for locations throughout the country and would focus on tourism, agriculture and industry. Investment law in the DPRK is ambiguous at the best of times as many important words in the statutes are not defined but rather left open to interpretation. This resulted in a rocky start to the SEZ program but over the years mutual trust has developed between international companies and the DPRK government and this in turn has allowed Chinese, Russian, Swiss, Mongolian, South Korean, Egyptian, and Italian companies to open up in he country. The most famous, profitable, and successful SEZ has undoubtedly been Rason. Here, many companies operate and tourists are often surprised that they are allowed to spend the local Won, shop freely at outdoor markets, and even open up an account at Triangle Bank! Fancy a trip to this unique country? Check out our tours here!